She was born in Poland and entered a family as one of three children. At age seven, she sailed with her mother across the Atlantic Ocean, to come to America. In Poland, under communist regime, entire families were not allowed to travel overseas at one time. Therefore Iza's mother sailed with her seven year old girl, leaving husband and two other children behind. Iza's mother hoped to eventually bring the rest of the family over to America, but unfortunately, before she was able to do so, she died. Before much longer, Iza's father also died in Poland and Iza was not able to be brought over to her home country and her siblings, a brother and a sister. Iza spent 3 1/2 years in a Catholic orphanage in New York, before completing high school and then moved to the Hudson River Valley. It would be twenty-five years before Iza would be reunited with her brother and her sister. This story has a familiar ring to it, historically speaking. America is used to the tired, poor, weary and downtrodden entering its shores and finding rest and opportunity here. It does not take too much to imagine that a little seven year old Polish girl would immigrate to America with her mother, only to find herself an orphan in a strange country. It is harder to imagine that Iza made this journey in 1961. Her story sounds like it belongs in the late 1880's, not in the second half of the 21st century! 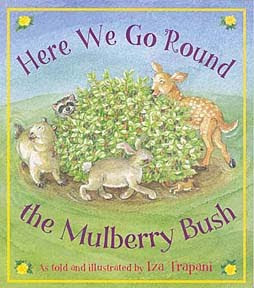 Iza learned to read and speak English with the initial help of a Mother Goose book. She spent her early years working as a nanny, short order cook and waitress while earning an art degree at the State University in New Paltz. 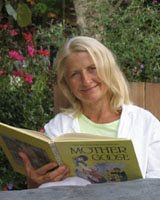 Always it was her dream to write picture books for children. 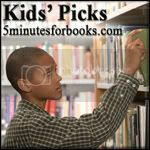 At this time, Iza has a wonderful collection of children's books to her name. (You can see the whole list of her books here.) She lives in Rifton, New York with her husband and stepson on a farm. You can see pictures of the farm by visiting her website. While Iza Trapani's name and history might have been unfamiliar to you, it is likely that her children's books have caught your attention before - at least by title! It was suggested to Trapani that she write verse additions, or to retell, classic story rhymes. Trapani wanted to pick titles that were familiar to children, so as to draw them to the books, and to pick sweet stories and songs such as Twinkle, Twinkle Little Star. 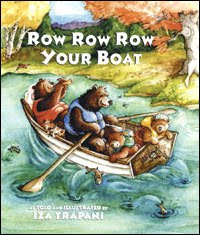 Bookworm1 and I were first introduced to Trapani through her book Row Row Row Your Boat . In this old/new song we travel down the river with a bear family who, bargaining for a fun family adventure, do not envision rainstorms effecting the journey. However, a little rain doesn't stop them from enjoying the journey and we meet all kinds of animals in the woods as they travel along. My mom brought this book along with her when she came up to Oregon to visit and we fell in love with it. 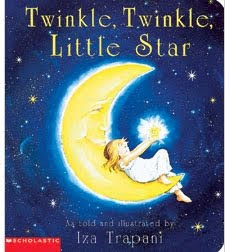 The next book we snatched up was Twinkle, Twinkle, Little Star which took us on a magical journey late at night, flying in the sky over lighthouses and other sleeping children. Trapani's verse additions fit in with the rhythm and tune of the original song and instead of feeling like an add-on or it feeling anywhere near dysfunctional, it adds to the song in a delightful way. She really did a good job of drawing her readers into simple songs and taking them on fun journeys. 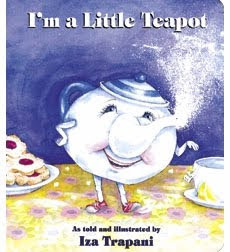 We have continued to explore Trapani's works through our local library, feasting on the songs and adventures of I'm a Little Teapot as Miss Teapot travels around the world. We have also enjoyed Baa Baa Black Sheep who doesn't appear to care for any of its animal friends until they all discover that while they thought he didn't care, he was using his wool for good purposes. Timeless songs + clever stories = a great deal of fun. If you haven't yet stumbled upon Iza Trapani's books, I would encourage you to do so. They are specifically geared for children aged 4-8 but my two year old has enjoyed them very much. Children are drawn to music and song and these books fit the bill completely, allowing you plenty of time to sing and read and dream a bit with your youngster. I am delighted to have some of these books in our family collection and hope to continue to add to it over time! 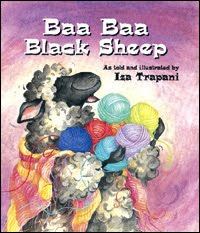 For more information about this talented author/illustrator, visit Iza Trapani's website. I LOVE the idea of using a familiar song or nursery rhyme as the basis of a story. Great fun! I'll have to look for these at the library. what an amazing story, it is wonderful to hear background and then read these wonderful stories that she created. We have the Teapot book, I believe, and some of the others look familiar from the library shelves, but I can't say that I knew ANY of the author's story. How incredible!! We will have to look for more by her! Thanks for sharing this story, Carrie! I hadn't heard it before. I will make a point to look for her books next time we are in the library! I love the look of the middle book! I'm really into artwork and great covers. Not that the kids totally care about it. This is one of my favorite children's authors, I adore the fresh twist she brings to the same ol' rhymes! My particular favorite is Jingle Bells, she takes you on a trip around the world to see how others celebrate their Christmas! Of course I love the horse! We love Trapani around here!! 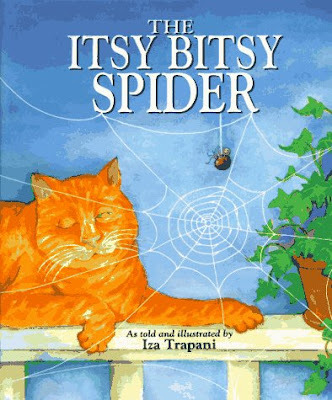 The Itsy Bitsy Spider is my favortie.